ISLAMABAD: (APS)August 31,2017-US Ambassador David Hale has clarified that President Trump did not blame Pakistan for failure in Afghanistan. He said this while talking to Prime Minister’s Advisor on National Security Nasser Khan Janjua in Islamabad on Thursday. They discussed the new US strategy on Afghanistan and South Asia, announced by President Trump on 20th of this month. 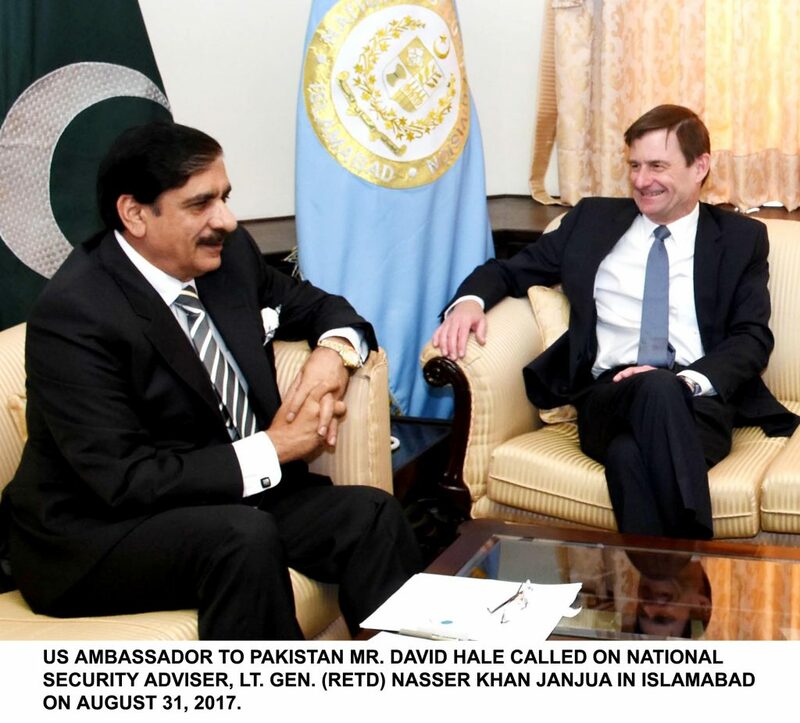 David Hale said America recognizes Pakistan’s sacrifices in the war on terror and hopes that it would continue to play its cooperative role. He said that the press had generally taken the policy piece by piece instead of interpreting it as a whole. He said it is also wrong to assume that the policy recommended a purely military solution or that engagement with Pakistan has been ruled out. He said the military strategy is just one piece of the policy which espoused a political solution. US Ambassador displayed a cooperative outlook and expressed his desire to work closely with Pakistan to find solutions. He said the new policy supports the role of regional countries in a peaceful settlement where Pakistan has an important role to play. David Hale said that the United States is thinking of reviving and accelerating the QCG and the Six-plus-One process on Afghanistan where Pakistan will have a leading role.